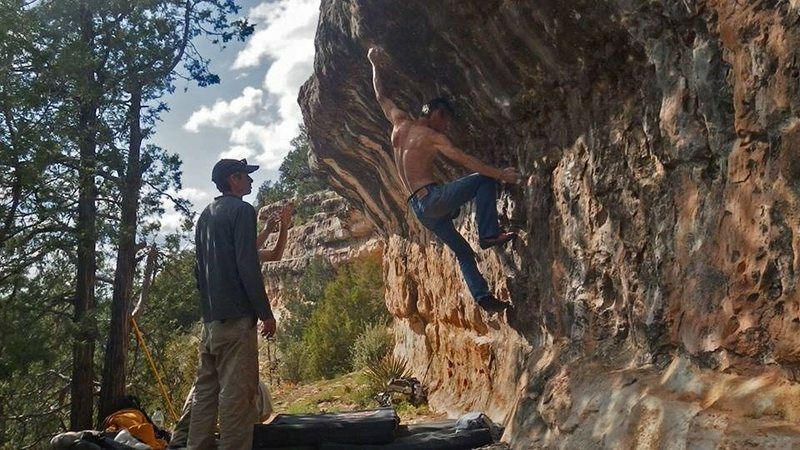 The bouldering areas above Lower Lake Mary consist of the long stretching, intermittent limestone band that runs from the Pit on the west, all the way to FR 128 on the east, where the limestone finally peters out, and the basalt starts to take over. FR 128 marks the start of Anderson Mesa, a basalt cap that dominates much of the north side of Upper Lake Mary. There are miles of basalt outcroppings above the highway, but the most traveled area is above the Lakeview Campground. These are old areas that have been climbed at for a long time, by a lot of good climbers. Robert Drysdale and friends established the Booze Pig Wall in the early 90's, along side the early development of Priest Draw. Most of these bands remain exploratory at this point, and have become overgrown. However, there are several areas that are more condensed, clean, and offer up a good concentration of excellent problems with often moderate grades on superb rock. There are probably hundreds of undocumented problems at the Ridge. The southern aspect makes these areas a real treat in the fall, spring, and even in the dead of winter depending upon the year. All of these areas are accessed off of Lake Mary road, with short uphill approaches and views of Lower and Upper Lake Mary, as well as Mormon Mountain off to the south east. These areas will require seasonal cleanings, especially after winter and the monsoons. If you get up there and find a fine layer a silt over everything, rest well in the knowledge that you are the first person up there in probably a long time. Usually a stick brush or broom will suffice to get rid of the surface silt, though having a short rope and harness to inspect the higher problems isn't a bad idea. Lake Mary Road is just south of Flagstaff, and the same road to access The Pit. Drive east on Lake Mary Road until you hit the very west end of Lower Lake Mary. Check the Drysdale Trail page for more detailed parking information. The other areas are east a ways down the road, and you can see their individual pages for more detailed directions. David Gershwin San Diego, CA. Thanks David. When it comes to the Ridge, it is my pleasure. Rob and I grew up in the same town, though he died the year I started climbing, so we never had a chance to meet in person. However, I heard many a story about the "Condor" as they called him back in Wisconsin. He was obviously talented on the stone, but also had the keen eye for good lines. The latter, being a skill our mutual mentor Dave Groth instilled in both of us. And thank god he did. I think Rob would be psyched to see the sports action going down, as Flagstaff starts to remember this timeless stone. As some you can tell I've done a little reorganizing, and added some walls so folks know this stuff is here.